The Jumpy is the medium size van from the French manufacturer Citroen. The first series came out in 1996. Since the Jumpy has been renewed twice, in 2007 and in 2016. The Jumpy has always excelled as a practical van with a generous load capacity for its external dimensions, and with pleasant driving characteristics. The model has sold well since its introduction and its success was reinforced by the launch of the third series in 2016. 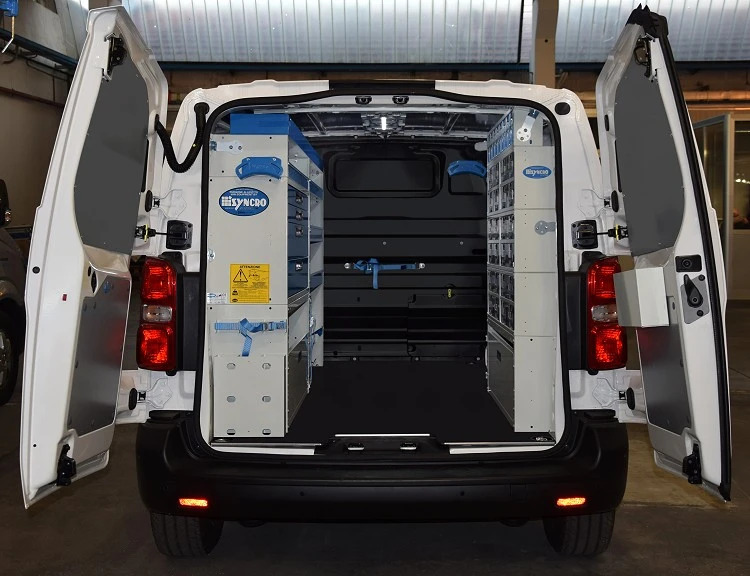 Proof of the Jumpy’s validity lies in the fact that the Syncro Group has fitted out thousands of these vans as mobile workshops for companies and tradesmen in all walks of life. This page illustrates a racking system installed in a Jumpy operated by a company specialising in electrical systems. All modern vans suffer from inadequate protection for the body panels of the load compartment, and the Citroen Jumpy is no exception. 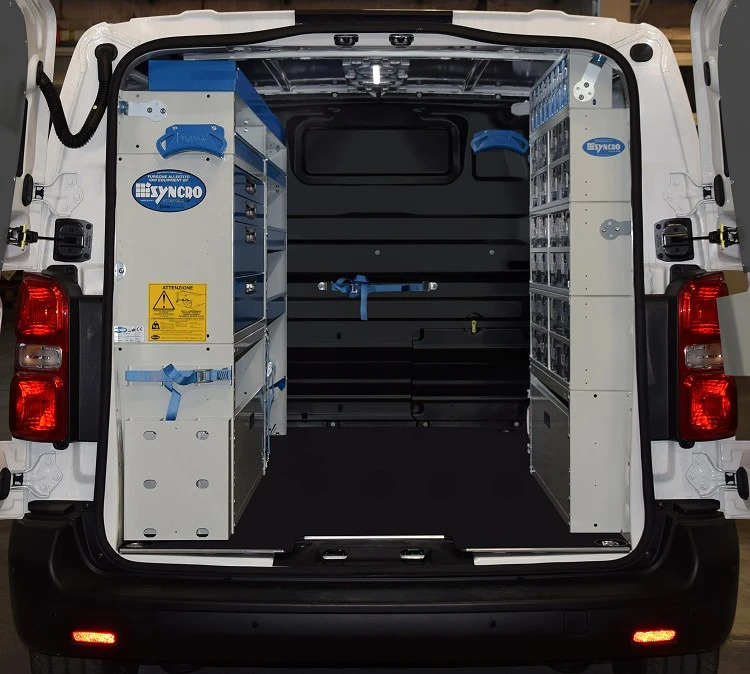 For this reason the first step in Syncro’s conversion project consisted of the installation of a floor liner in 12 mm thick resinated birch plywood. This not only provides effective protection for the original metal floor but also forms a perfectly flat surface, the ideal support for racking. The side walls and doors were then lined with laser cut, galvanised and painted steel panels. The installation of proper liners like these protects the van’s body against the sort of damage that can easily occur during normal use. Looking at the racking in detail, we can see two wheel arch cabinets at the bottom of the left side wall. One of these features Syncro’s patented lift-and-rotate door, which provides full-height access. The other has been left open and is fitted with straps for securing the tool cases carried by the van operators. Further up, still on the left, are four large metal drawers with ball bearing mounted telescopic runners, automatic locking, non-slip mats and aluminium dividers. There are also four shelves, again fitted with mats and dividers. 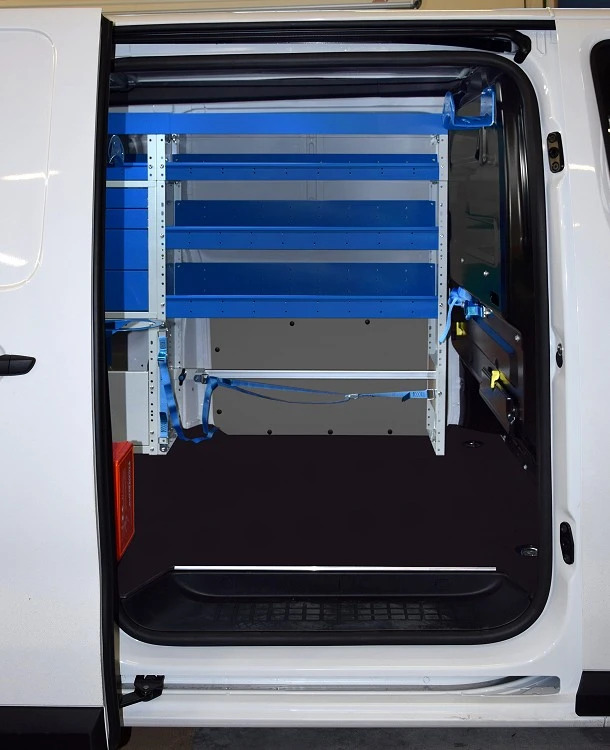 The top of the left side racking consists of a full-length tray with a rear access door, ideal for carrying long items like pipes, posts and cable channels. The racking on the right side wall consists of a generous set of transparent drawers and containers, pull-out at the bottom, tilting at the top. These are made from PMMA, the same high strength material used to make aircraft windows. Transparent drawers and containers are ideal for carrying lots of small items, as the contents are always fully visible and easy to identify. The drawers incorporate an automatic system that locks them shut but can be completely removed for use elsewhere when necessary. 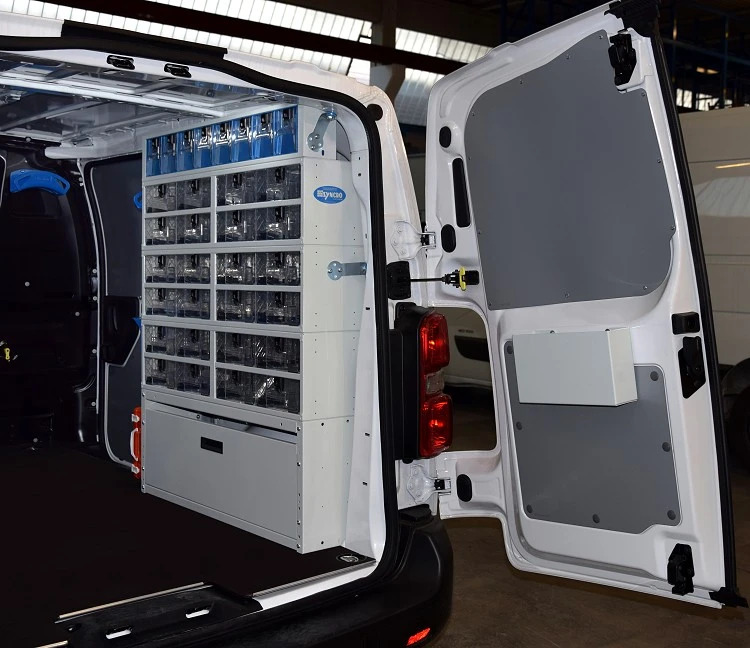 The racking on this side of the van stands on a wheel arch cabinet with a full-height door. 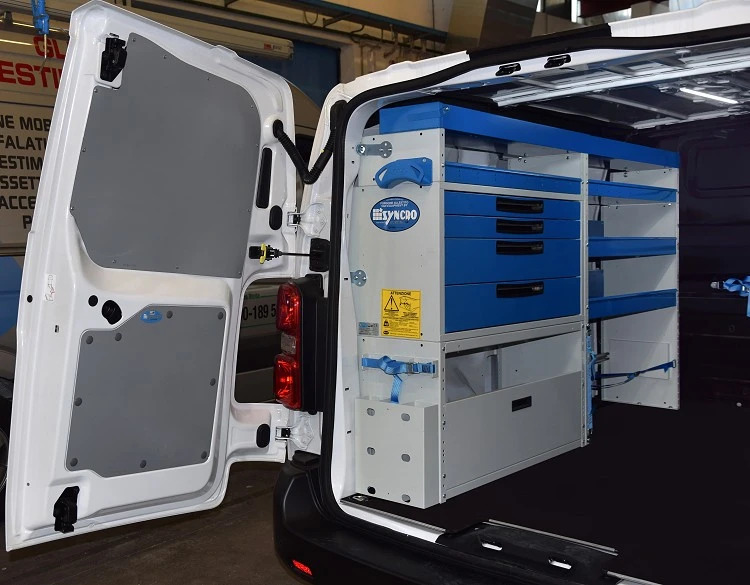 The customer has also selected various items from Syncro’s vast range of accessories to make the racking even more practical and efficient. 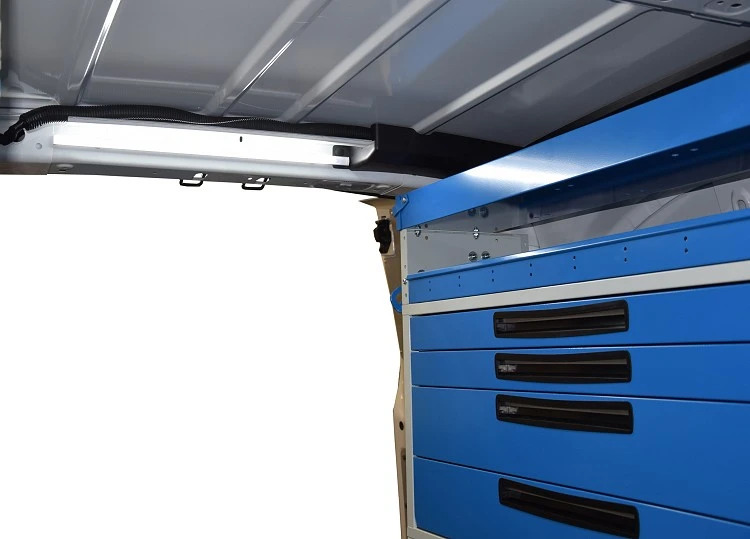 The load compartment is brightly lit by two powerful, low consumption, compact LED ceiling lights. The bulkhead has been fitted with an aluminium cargo rail and strap and a cable holder, while the rear of the left side racking features another cable holder and a rack and strap for securing long items. 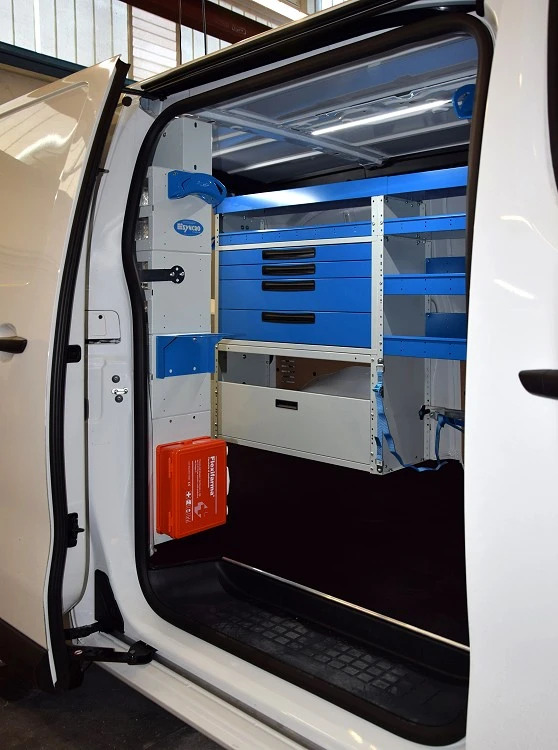 At the front of the right side racking, near the van’s side door, is yet another cable holder, a holder for Scrubs hand wipes and a first aid box. As always, the Syncro team can be well pleased with their work. This Jumpy has been transformed into a practical workshop that will allow the company’s electricians to work more safely and more efficiently!